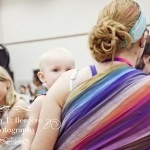 This is my 44th installment of Babywearing Stories 365. Each installment features a babywearer in 1 photograph and their answers to 5 questions. My goal is to normalize, promote and celebrate daily Babywearing, moving beyond *what* we use to carry our babies and shifting focus back on *why* and *where* we carry. I hope to share the stories of moms, dads, and babywearing caregivers all over the world. Enjoy! I am Stephanie Bell, a mommy of two girls. I got interested in baby-wearing while researching cloth diapers before my first daughter was born. My DD2 Paisley is being worn in this photo. My DD1 Emmy is also here, along with my travel buddies, Laura and her clan. This photo was taken in DC, at the baby-wearing conference. I am using a ring sling, a wrap conversion ring sling. This is my first reattempt at the ring sling since Paisley was a newborn. This lovely wearing experience helped me refind the ring sling love. We are enjoying the conference after eating out lunch and Paisley was starting to get tired. I am babywearing because we are at a babywearing conference, kind of what we do. =) But more importantly I am wearing because Paisley was starting to get tired, and when she gets tired, she get crazy and hyper, and this was my way to control that.